Tatiana Yugay teaches world economy, international economic relations, and economic theory at the Moscow State University of Economics, Russia. You may also interested in visiting her blog "Santatatiana" where she describes her travels in search for Medieval Italy. She has nicely agreed to write this post expressly for this blog. Obama: "We're united in imposing a cost on Russia for its actions". As an economist, I'm more interested in the economic consequences of sanctions for Russia and for the West. As soon as Western leaders threaten Russia with three levels of sanctions, I'll follow their fuzzy logic. After weeks of threats, US and EU leaders finally produced their first sanction tool kits. From March 17, the U.S. disclosed two sanctions lists against 27 Russian officials and businessmen and one bank. As the US Treasury stated, “sanctions target Russian government officials, the inner circle that supports them, and the Bank “Rossiya”, the personal bank for officials of the Russian Federation. The measures included the freezing of assets in the USA and the prohibition for Americans to enter into business relationships with those from the sanctions list”. The EU sanctions were imposed on 33 Russian and Ukrainian officials. In addition, Canada blacklisted 14 Russian citizens and the bank “Rossiya”. In fact, the Canadian list doesn't include any new person. These lists immediately became a target for mockery by the Russian establishment. Both Chambers of the Russian Parliament advised the West to include them all in the list. The Russian State Duma, the lower House of Parliament, has unanimously passed a statement in which they volunteered to be subject to the US and EU sanctions imposed on individual Russian officials and lawmakers. "We suggest that Mr. Obama and EU bureaucrats put all of the Duma deputies who voted for Crimea's accession to Russia and for this resolution on the 'black list' of persons subject to the US and EU sanctions," the statement says. Those who were included in the black list regarded that fact as a recognition of their great services for the Motherland. Presidential aide Vladislav Surkov admitted ironically that he perceives sanctions as a "political Oscar" from America, a sort of Academy Award for best supporting actor. Deputy Prime Minister Dmitriy Rogozin ironically regards sanctions as a «global recognition” by “the Washington obkom [provincial party committee]” and in a more serious mode expresses the feeling of millions of Russians that "All sanctions do not worth a grain of sand of the Crimean land". Sanctions have already become a part of Russian folklore. The Russians have a lot of fun posting up everywhere comic notices, such as, “Sanctions!!! Forbidden to enter the premises with Obama or his housemates”. Joking aside, who was really hurt by the current sanctions? Millions of account holder of the bank “Rossiya” had temporary difficulties when the payment systems “Visa” and “MasterCard” suspended its service for plastic cards. President Putin said that he wasn't yet a client of this bank but in order to support the bank he decided to transfer his salary account to the bank. Immediately, many high rank officials and hundreds of common citizens followed his example. So sanctions served as an excellent PR action for the bank. The Bank of Russia promised to exercise further support to the bank “Rossiya” and several affiliated banks. Another “penalty” inflicted on Russia by the West was an attempt to expel the country from the G8. As Russian FM Lavrov reasonably stated, "the G8 is an informal club. No one hands out membership cards and no one can be kicked out of it... Russia is not clinging to the G8 format, as all major world problems can be discussed at other international venues such as G20”. Finally, instead of Russia's expulsion, the G7 leaders decided to exclude themselves from G8 or “to suspend their participation in the G8 until Russia changes course”. They agreedto hold their own summit this year instead of attending a planned G8 meeting in the Russian Olympic town of Sochi. However, “the decision to suspend the participation of the seven leading industrial powers in the Group of Eight does not mean the final rejection of the G8 format," Italian Minister of Foreign Affairs Federica Mogherini stated onthe sidelines of the Hague international summit on nuclear security. Though sanctions didn't really hurt people, Russian stock exchanges began reacting nervously to expected and predicted sanctions. Thus, according to different forecasts capital flight could reach in 2014 from 60-100 to 150 bn dollars. At that, the main international institutions and funds have already lowered their forecasts for economic growth in Russia. In the first (very optimistic) case, the GDP growth in 2014 in Russia will be 1.8%. According to the realistic scenario of 100 bn outflow, a zero growth is expected. The World Bank also predicts a shock scenario when the capital flight can reach 150 bn and the Russian economy would contract by 1.8%. Financial markets react nervously not only to sanctions' expectations but also to undeclared sanctions. The most obvious case is the current activity of the US-based rating agencies, which have speedily downgraded Russia's ratings. Thus, on March 20, the S&P rating agency downgraded Russia's sovereign rating from "stable" to "negative" due “to possible consequences of sanctions by the U.S. and the EU”. On March 21, the Fitch agency downgraded Russia's ratings from "stable" to "negative". On March 29, the International rating agency Moody's Investors Service put the sovereign credit rating of the Russian Federation, which is now at the level of "BAA1", on review for the downgrade prospect. Recently the rating agencies downgraded ratings of major Russian companies such as “Gazprom", "Russian Railways", "Atomenergoprom", " Lukoil ", " Federal Grid Company of Unified Energy System", "Sukhoi Civil Aircraft", "Federal Passenger Company" and " Gazprom Oil", as well as, cities of Moscow and Saint Petersburg. These steps were highly predictable, since these rating agencies are based in the USA and were repeatedly suspected to operate to damage Russia. Russia's Deputy Finance Minister Alexei Moiseev statedthat “the downward revision seems to us surprising. Obviously, Russia belongs to a very small group of countries with a current account surplus and about zero budget deficit, I'm not talking about our debt level [which is one of the lowest in the world]. Generally I can not imagine any situation when we might have a problem with solvency”. According to experts, the downgrading is a designed action related to the firm Russian stance on the Crimea. In fact, the economic and financial situation in the country is stable. However, low ratings will make external borrowing more expensive. One further example of invisible penalties has affected more American businesses than Russian ones. On March 1, or long before official sanctioning of Russia, the Bureau of Industry and Security (BIS) under the U.S. Department of Commerce which is responsible for export control, decided to suspend the issuance of licenses for the transfer of American dual-use production to Russia. Almost a month later, the U.S. State Department has imposed restrictions on the sale of military and dual purpose products to Russia. However, these provisions doesn't concern already approved deals. In 2013, the BIS approved a total of 1832 supply contracts with Russia by American manufacturers on various dual-use items that can be used for both civilian and military purposes. The total amount of these agreements reached $1,491 billion. Thus, American producers can lose approximately the same sum of money. Furthermore, quite unexpectedly, the American side notified Russia of the suspension of cooperation in the fight against drug trafficking. At first, Victor Ivanov, Director of the Russian Drug Control Service, was unreasonably included into the US blacklist. After that, the Acting head of the White House Office of National Policy in the field of drug control Michael Botticelli declined an invitation to visit Moscow. This unfriendly and unmotivated action has undermined the Russian-US cooperation in countering drug trafficking which has resulted in many successful operations against opium laboratories in Afghanistan and cocaine transportation from Latin America to Europe. The Russian agency’s press release says that “Eventually, thoughtful observers and experts can suggest only one possible explanation behind Washington’s arbitrariness – lack of readiness for positive cooperation and fright of responsibility for the 40-fold explosive increase of illegal drug production in Afghanistan since its occupation by the US and NATO forces in 2001”. One more invisible sanction is designed to punish all Russian citizens of Crimea without exclusion. According to the press service of the European Commission, the European Union banned the issue to Crimean Russian citizens of all kinds of European visas, including Schengen, in embassies and visa centers of EU countries on the territory of the Russian Federation. According to the decision of the European Council, an EU visa will be issued to residents of Crimea only in Ukraine, because (according to Brussels) Crimea is a part of this country. At that, in order to obtain a visa residents of Crimea should contact embassies of EU states in the Ukraine with the passport of a citizen of this country [Ukraine]. Thus, a Crimean Russian citizen can't get an EU visa, by definition. I don't believe that Crimeans would refuse a long-awaited Russian citizenship in exchange for a trip to Europe. Moreover, the EU once again suspended the talks on visa-free regime for Russian citizens. Fortunately, Italy, the most beautiful European country and favorite travel destination for Russians, remains with the earlier agreements despite the threat of sanctions against Russia from Brussels. On March 24, Italian Ambassador to Russia Cesare Maria Ragaglini announced the start of the process on simplification of visa procedures for Russians, up to providing visas free of charge for participating in events in the framework of the Russian-Italian cross-years on tourism. This long post was originally published on the "Oil Drum" in 2009. I think I can repropose it here as follow-up of a recent post of mine dealing with the fall of the Roman Empire. A silver mask that had belonged to a Roman cavalryman of imperial times. It was found on the site of the battle of Teutoburg, fought in September 9 a.d. This year, 2009, marks the 2000th anniversary of the battle that led to the annihilation of three Roman legions and changed forever the history of Europe. It was a tremendous shock for the Romans, who saw their mighty army destroyed by uncivilized barbarians. It was not yet the peak of the Roman Empire, but it was a first hint that something was deeply wrong with it. This text describes the presentation that I gave at the "Peak Summit" in Alcatraz (Italy) on June 27, 2009 (the picture shows me speaking there). It is not a transcription, but something that I wrote from memory, mostly in a single stretch, while I had it still fresh in my mind. The result is that my 40 minutes talk became a text of more than 10,000 words, much longer than a typical internet document (but still less than Gibbon's six volumes on the same subject!) A talk, anyway, can be longer and more effective than a post, mostly because the people listening to you are not distracted by the infinite distractions of an internet connection. So, I wrote this post trying to maintain the style of an oral presentation. I don't know if it will turn out to be more easily readable than the usual style but, if you arrive to the end, you'll tell me what you think of it. Ladies and gentlemen, first of all thank you for being here. This afternoon I'll try to say something about a subject that I am sure you are all interested in: the decline and the fall of the Roman Empire. It is something that has been discussed over and over; it is because we think that our civilization may follow the same destiny as the Roman one: decline and fall. So, the Roman Empire offers us some kind of a model. We can say it is the paradigm of collapsing societies. And, yet, we don't seem to be able to find an agreement on what caused the collapse of the Roman Empire. Historians - and not just historians - have been debating this subject and they came up with literally dozens of explanations: barbarian invasions, epidemics, lead poisoning, moral decadence and what you have. Which is the right one? Or are all these explanations right? This is the point that I would like to discuss today. I'll be focusing on the interpretation of Joseph Tainter, based on the fact that empires and civilizations are "complex" systems and try to use system dynamics to describe collapse. Before we go into this matter, however, let me add a disclaimer. I am not a historian and I don't pretend to be one. It is not my intention of criticizing or disparaging the work of historians. You see, there are several ways of making a fool of oneself: one which is very effective is to try teaching to people who know more than you. For some reasons, however, it happens all the time and not just with history; just look at the debate on climate change! So, what I am trying to do here is just to apply system dynamics on the history of the Roman Empire which - as far as I know - has not been done, so far. It is a qualitative version of system dynamics; making a complete model of the whole Roman Empire is beyond my means. But the results are very interesting; or so I believe. The collapse seen from inside. Let's start from the beginning and here the beginning is with the people who were contemporary to the collapse, the Romans themselves. Did they understand what was happening to them? This is a very important point: if a society, intended as its government, can understand that collapse is coming, can they do something to avoid it? It is relevant to our own situation, today. Of course, the ancient Romans are long gone and they didn't leave us newspapers. Today we have huge amounts of documents but, from Roman times, we have very little. All what has survived from those times had to be slowly hand copied by a Medieval monk, and a lot has been lost. We have a lot of texts by Roman historians - none of them seemed to understand exactly what was going on. Historians of that time were more like chroniclers; they reported the facts they knew. Not that they didn't have their ideas on what they were describing, but they were not trying to make models, as we would say today. So, I think it may be interesting to give a look to documents written by people who were not historians; but who were living the collapse of the Roman Empire. What did they think of what was going on? Image from an advertising campaign for Pirelli in the 1990s. Empires seem to be a typical human structure that reappears over and over in history. The problem is that empires are often so efficient that they tend to overexploit and destroy even theoretically renewable resources. The final result is a destructive cascade of feedbacks: not only the empire gradually runs out of resources, but it also runs out of the capability of controlling them; with the two effects reinforcing each other. Power is nothing without control. And, usually, control seems to run out before power. In practice, empires in trouble tend to fragment into independent blocks or statelets before actually disappearing as economic systems. It is the result of the increasing costs of control, which are not matched any more by the diminishing flux of natural resources. We have seen this phenomenon in recent times with the fragmentation and the disappearance of the Soviet Union. We may be seeing it today with the modern worldwide empire we call "Globalization." The recent events in Ukraine seem to show that the system, indeed, has troubles in controlling its periphery and may soon fragment into independent blocks. Of course, it is still too early to say whether what we are seeing today in Ukraine is just a bump in the road or a symptom of impending systemic collapse. As usual, however, history may be a guide to understand what lies ahead. In the following post, I examine the collapse of the Roman empire in light of considerations based on control and resources. It turns out that, even for the ancient Romans, power was nothing without control. 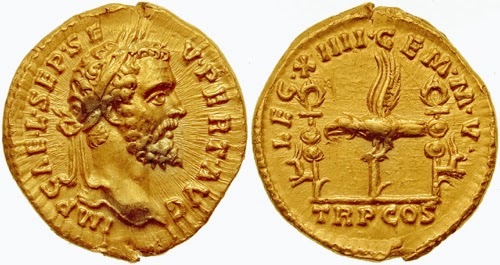 A Roman "Aureus" minted by Emperor Septimius Severus in 193 CE. At nearly 8 grams, the Aureus was truly an imperial coin - the embodiment of Rome's wealth and power. (image from Wikipedia). In this post, I argue that precious metal currency was a fundamental factor that kept together the Roman empire and gave to the Romans their military power. But the Roman mines producing gold and silver peaked in the first century CE and the Romans gradually lost the capability of controlling their resources. In a way, they were doomed by "peak gold." When I heard for the first time that the Roman Empire fell because of the depletion of its silver and gold mines, I was skeptical. Compared to our situation, where we are facing the depletion of fossil fuels, the Roman case seemed to me to be completely different. Gold and silver don't produce energy, they don't produce anything useful. So, why should the Roman Empire have fallen because of something we might call "peak gold"? And yet, as I delved into the matter, I noticed how evident was the correlation of declining gold and silver availability with the decline of the Roman Empire. We have scant data on the production of Roman mines, mainly located in Spain, but it is commonly believed that production peaked at some moment during the first century CE (or perhaps early 2nd century CE). Afterwards, it rapidly dwindled to nearly nothing, even though gold mining never completely stopped (1). As you can see in the figure, the loss of precious metal production was reflected in the silver content of the Roman currency. The Romans didn't have the technology needed to print paper bills, so they just debased their silver currency, the "denarius," by increasing its copper content. By mid 3rd century, the denarius was nearly pure copper: "fiat money" if there ever was one. During that period, gold coins were not debased, but they basically disappeared from circulation. (graph above from Joseph Tainter (2)). As I argued in a previous post, the progressive disappearance of precious metals correlates well with the various events that took place during the declining phase of the empire and with its eventual demise. Of course, correlation doesn't mean causation but, here, the correlation is so strong that you can't think it is just a question of chance. With time, it appeared clear to me that there were also clear links between several factors in the collapse of the Empire. 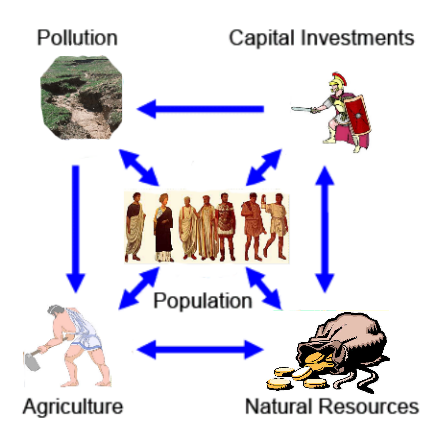 In general, complex systems tend to fall in a complex manner and the Roman Empire did not simply fall because of the lack of its primary energy source which, at that time, was agriculture. Energy (and power) is useless without control and for the Romans controlling the energy generated by agriculture requires capital investments for troops and bureaucracy. Both were affected by the decline of the production of precious metals. In time, the reduced military effectiveness of the empire disrupted the ability of controlling the agricultural system. That condemned the Empire to collapse. This is a hugely complex story that can't possibly be exhausted with a mere blog post. Nevertheless, the problem is very general and it can be condensed in a single sentence: "power is nothing without control" So, I believe it is possible to lay down in a relatively short space the main elements of the interplay between gold, military power, and food in Roman times. Let me try. Ultimately, what creates and keeps together empires is military force. The Roman Empire was so large and so successful because it was, possibly, the mightiest military force of its times. The Romans had been so successful at that not because of special military innovations. The recipe for their success was simple: they paid their fighters with precious metal currency. The combined technology of gold mining and coin minting had allowed the Romans to create one of the first standing armies in history. Still today, we call our enlisted men "soldiers", a term that comes from the Roman word "Solidus;" the name of the late empire gold coin. Not only money could create a standing army, it could also swell it to large sizes. Enlisting in the legions - the backbone of the army - was reserved to Roman citizens, but anyone could enlist in the "auxilia", the "auxiliary" troops. 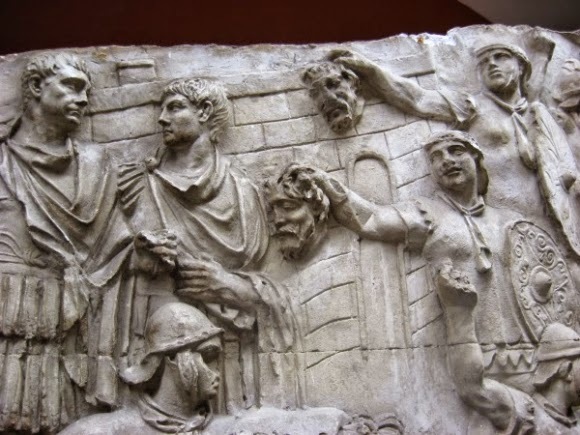 In the figure, you see Roman auxilia (recognizable by their round shields) presenting the severed heads of Dacian warriors to Emperor Trajan during the Dacian campaign of the 2nd century CE. Normally, Romans were not supposed to cut off the heads of defeated enemies. It was seen as uncivilized, but the auxilia were notoriously a little unruly (note how the Emperor, on the left, looks perplexed). But, by the time of the Dacian wars, the auxilia had become a fundamental part of the Roman army and they were to remain so for the remaining lifetime of the Empire. Gold and silver were essential elements in the hiring of troops for the Romans and that was especially true for foreign ones. Put yourself in the caligae (sandals) of a German fighter. Why should you put your framea (lance) in the service of Rome if not because you were paid? And you wanted to be paid in serious money; copper coins would not do. You wanted gold and silver currency that you knew could be redeemed anywhere in Europe and especially in that gigantic emporium of all sorts of luxury goods that was the city of Rome, the largest of the ancient world. And, by the way, where did these luxury items come from? Mostly, were imported. Silk, ivory, pearls, spices, incense, and much more came from India and China. Importing these items was not just an extravagant hobby for the Roman elite, it was a tangible manifestation of the power and of the wealth of the empire; something that was an important factor in convincing people to enlist in the auxilia. But the Chinese wouldn't send silk to Rome in exchange for worthless copper coins - they wanted gold and they obtained it. Then, that gold was lost forever for the Empire which, basically, could produce only two things in addition to precious metals: grain and troops, neither of which could be exported at long distances. This situation explains the gradual military decline of the Roman empire. With the decline of the precious metal mines, it became more and more difficult for emperors to recruit troops. The lack of a strong central power caused the empire to become engulfed in civil wars; with the army mainly engaged in fighting chunks of itself and the empire splitting in two parts: the Eastern and the Western. During this phase, the number of troops was not reduced, but their quality strongly declined. After the military reform by Emperor Diocletian during the third century CE, the Roman army was formed mainly of limitanei; not really an army but a border police unable to stop any serious attempt on the part of foreigners to puncture the borders. To keep the empire together, Emperors relied on the "comitatenses" (also known by other names) mobile crack troops which would plug (or try to plug) the holes in the border as soon as they formed. The combination of limitanei and comitatenses worked for a while to keep the barbarians out of the Empire. But the hemorrhage of gold and silver continued. So, during the last decades the empire, the paradigmatic Roman troops were the "bucellarii" a term that means "biscuit eaters". The name can be taken as implying that these troops fought for food. 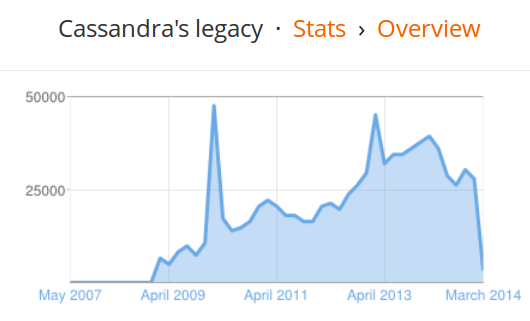 Of course that may not have been always true, but it is a clear indication of the dearth of money of the time. There are also reports of troops paid in pottery and in some cases with land - the latter use may have been a factor in creating the feudal system that replaced the Roman empire in Europe. In a way, as we see, the Romans were doomed by their "peak gold" (and also "peak silver). By the loss of their precious metal supply, the Romans lost their ability to control their troops and, as a result, of their resources. And power is nothing without control. But the Roman empire did not fall just because it was invaded by foreigners or because it split into multiple sectors. It experienced a systemic collapse that wasn't just a military one: it involved the whole economy and the social and political systems as well. To understand the reasons for the collapse, we need to go more in depth in the way the Roman economic system worked. The energy of the Roman Empire came from agriculture; mainly in the form of grain. At the beginning of their history and for several centuries onward, it seems that the Romans had little or no problems in producing enough food for their population. That makes sense considering that in Roman times the population of Europe was less than one-tenth of what it is today and hence there was plenty of free space for cultivations. Reports of food problems in the Empire appear only with the 1st century CE and truly disastrous famines appear only with the 5th century CE - when the Western Roman Empire was already in its terminal phase. "Peak food", apparently, came much later, about 3-4 centuries later than "peak gold". The very existence of a "peak food" for the Roman empire is somewhat puzzling: agriculture is, in principle, a renewable technology that had been able to feed the Roman population for several centuries. During the last period of the empire, there is no evidence of a population increase; on the contrary, it is clear that it declined. So, why couldn't agriculture produce enough food? The problem is that producing food doesn't just involve plowing some land and sowing crops. Agricultural yields depend on the vagaries of the weather and, more importantly, agriculture has the tendency of depleting the land of fertile soil as a result of erosion. To avoid this problem, the ancient had a number of strategies: one was nomadism. From Caesar's "De Bello Gallico" we learn that, as late as in the 1st century BCE, European populations still practiced a nomadic life style. They would do that in order to find new, pristine land and planting crops in the rich soil that they could produce by slashing and burning trees. That was possible because continental Europe, at that time, was nearly empty of people and entire populations could move unimpeded. The Romans, instead, were a sedentary population and they had the problem of soil depletion. As population grew, it became a larger and larger problem, especially in a mountainous region such as Italy (3). In addition, some urban centers, such as Rome, became so big that they were impossible to supply using just local resources. With the 1st century BCE, the situation led to the development of a sophisticated logistic system based on ships that carried grain to Rome from the African provinces, mainly Libya and Egypt. It was a major task for the technology of the time to ensure that the inhabitants of Rome would receive enough grain and just when they needed it. It required large ships, storage facilities and, more than all, a centralized bureaucracy that went under the name of "annona" (from the Latin world "annum", year). So important it was this system, that Annona was turned into a full fledged Goddess by imperial propaganda (you can see her in the image above, on the back of a coin minted at the time of Emperor Nero - from Wikipedia). For us, turning bureaucracy into a divine entity may appear a bit farfetched but, perhaps, we are not so far away from that. Despite its complexity, the Roman logistic grain system was successful in replacing the insufficient Italian production and it permitted to feed a city as large as Rome, whose population approached (and perhaps exceeded) one million inhabitants during the heydays of the empire. But it was not Rome alone which benefited from the Annona and the system could create a relatively high population density concentrated along the shores of the Mediterranean sea. It was this higher population density that gave to the Romans a military edge over their Northern neighbors, the "barbarians", whose population was limited by a lack of a similar logistic system. But what actually moved grain from the shores of Africa to Rome? In part, it was the result of trade. For instance, grain shipping companies were in private hands and they were paid for their work. But grain itself didn't move because of trade: the provinces shipped grain to Rome because they were forced to. They had to pay taxes to the central government and they could do so either in currency or in kind. It seems that grain producers paid usually in kind and Rome didn't ship anything in return (except in terms of troops and bureaucrats). So, the whole operation was a bad deal for provinces but, as usual in empires, opting out was not allowed. When, in 66 CE, the Jews of Palestine decided that they didn't want to pay taxes to Rome any more, their rebellion was crushed in blood and Jerusalem was sacked. In the end, it was military power that kept the system under control. The Roman Annona system may not have been fair, but it worked fine and for a long time: at least a few centuries. It seems that the African agricultural system was managed by the Romans with reasonable care and that it was possible to avoid soil erosion almost until the very end of the Western Empire. Note also that the Annona system doesn't seem to have been affected - in itself - by the debasing of the silver denarius. This is reasonable: grain producers had no choice; they couldn't export their products at long distances and they had only one market: Rome and the other major cities of the empire. But the system that fed the city of Rome appears to have rapidly declined and finally collapsed during the 5th century CE. We have some evidence (3) that it was in this period that erosion turned the North African shores from the Roman "grain belt" into the desert we see nowadays. Possibly, the disaster was unavoidable, but it is also true that warfare does a lot of damage to agriculture and this is surely true for the North African region, object of extensive warfare during the last period of the Roman Empire. More in general, the strain to the economic system generated by continuous warfare may have led producers to overexploit their resources, privileging short term gains to long term stability. Were it not for these events, it is likely that the agricultural productivity of the land could have been maintained for a much longer time. But that was not the case. in 455 AD, King Genseric of the Vandals (see his face on a "siliqua" coin in the figure) could not be paid anymore. Then, he had no more reasons to keep shipping grain to Rome. So, he loaded the ships with warriors instead of grain and proceeded to sack the city in the same year. That was the true end of Rome, whose population shrunk from at least a few hundred thousands to about 50,000. It was the end of an age and never again would the North African shores be exporters of food. Complex systems tend to fall in a complex manner and several interlocked factors played a role together first in creating the Roman empire, then in destroying it. At the beginning, it was a technological innovation, coinage of precious metals, that led the Romans to develop a military might that allowed them to access a resource which would have been impossible to exploit otherwise: the North African agricultural land. But, as it is often the case, the exploitation mechanism was so efficient that eventually it destroyed itself. Lower productivity of the precious metal mines reduced the efficiency of the Roman military system and this, in turn, led to fragmentation and extensive warfare. The increasing needs of resources for war were an important factor in destroying the agricultural system whose collapse, in turn, put an end to the empire. The dynamic interplay of the various elements involved in the growth and the fall of the empire can be seen in the figure below, from a previous essay of mine. In the diagram, the source of energy is agriculture, but it is just an element of a complex system where various entities reinforce or dampen each other. The diagram is patterned after the one originally created by Magne Myrtveit for our society described in the 1972 "Limits to Growth" study. This, as other studies of the same kind, provide a nice, aggregated view of the trajectory of an economic system which tends to overexploit the resources it used. As models, however, they are not completely satisfactory in the sense that they don't include the question of control. It is a cost which needs to be paid and the gradually declining flow of resources makes it difficult. As a result, empires rarely collapse smoothly and as a whole, but rather tend to fragment and engage in internecine wars before actually disappearing. That was the destiny of the Roman Empire which experienced the general rule that power is nothing without control. It has always been fashionable to see the Roman Empire as a distant mirror of our civilization. 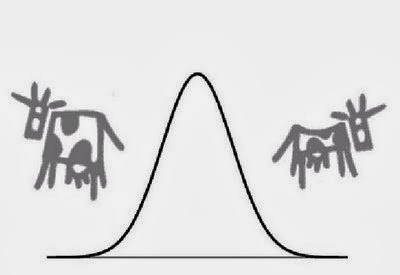 And, indeed, we see that the points of contact are many. Just think of the sophisticated Roman logistic system: the navis oneraria which transported grain from Africa to Rome are the equivalent of our super-tankers transporting crude oil from the Middle East to Western countries. And think how China and India are playing today exactly the same role they were playing in the remote Roman times: they are manufacturing centers which are gradually soaking the wealth of the empire that we call, today, "globalization". This said, there is also an obvious difference. The Roman energy system was based on agriculture and hence it was theoretically renewable, at least until the Romans didn't overexploit it. Our system is based on fossil fuels, which are obviously non renewable resources. Hence, we tend to be more worried about the depletion of our energy resources rather than that of gold and silver which - it seems - we could safely remove from our financial system without evident problems. Still, there remains the fundamental problem that power is useless without control. The control system of the globalization empire works on similar principles as the older Roman one. It is based on a sophisticated financial system which, eventually, works because it is integrated with the military system. In the globalized army, soldiers, just like the Roman ones, want to be paid. And they want to be paid with a currency that they can redeem with goods and services somewhere. The dollar has, so far, played this role, but can it play it forever? Eventually, everything that humans do is based on on some form of belief of what has value in this world. The Romans saw gold and silver as stores of value. For us, there is a belief that bits generated inside computers are stores of value - but we may be sorely disappointed. Not that there will ever be a "peak bits" as long as there are computers around, but surely a major financial collapse would not just impoverish us, but most of all it would disrupt our capability of controlling the energy resources we need so desperately. So, when oil pundits line up oil reserves as if each barrel were a soldier ready for battle, they tacitly assume that these reserves will available for use of the global empire. That's not necessarily true. It depends on the degree of control that the empire will be able to exert on producers. That depends on the financial system which may well turn out to be the weak link of the chain. Without control, power is useless. The Roman empire was lost when the financial system ceased to be able to control the military system. When the Romans lost their gold, everything was lost. In our case, it may well be that we will lose our ability to control the military system before we actually lose our ability to produce energy from fossil fuels. If the dollar loses its predominance in the world's financial system, then producers may be tempted to keep their oil for themselves or, at least, not so enthusiastic any more in allowing the Empire to access it. What's happening today in Ukraine may be a first symptom of the impending loss of global control. "The decline in EROI among major fossil fuels suggests that in the race between technological advances and depletion, depletion is winning. Past attempts to rectify falling oil production i.e. the rapid increase of drilling after the 1970 peak in oil production and subsequent oil crises in the US only exacerbated the problem by lowering the net energy delivered from US oil production (Hall and Cleveland, 1981). Increasing prices, thought by most economists to negate depletion through increasing incentives for exploitation, cannot work as EROI approaches 1:1, and even now has made oil too expensive to support the high economic growth it once did." Image from "Our Finite World"
When I saw for the first time the data about oil production in Yemen, I was so impressed that I wanted to know more. I found a news source in English - the "Yemen Times" and I placed the link in my feed. For several months, by now, I have been reading the news from a place where I have never been and, probably, will never go, but that I find incredibly fascinating. The stories in the Yemen Times read as a tragedy written by Shakespeare: for a taste of this feeling, you may read the article titled "Carrying out a death sentence," but it is just an example of a never ending series of disasters taking place in the country, which include some 4000 people murdered every year, including a few taken as target by American drones flying over the country. 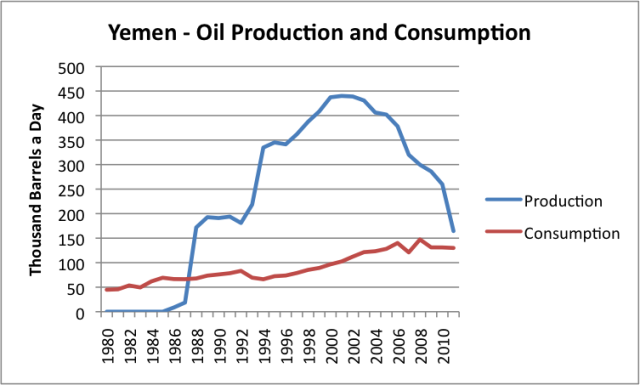 Surely, not everything that's taking place in Yemen is to be attributed straight to crude oil but, surely, with oil production now crossing consumption, with the government getting about 70% of its revenues from oil, and with Yemen producing very little that can be exported apart from the "Qat" drug, then some kind of disaster is to be expected. And consider that population continues to grow: Yemen has now about 25 million people (and 50 million guns). What is perhaps most startling of the news that you read on the "Yemen Times" is that crude oil is rarely mentioned - except to say that everything is fine and production will soon increase. It seems that the real reason of collapse must remain hidden from those who are experiencing it. Yemen, surely, is not the only case. Although oil depletion is rarely mentioned in the Yemen Times, sometimes it is and recently an article appeared that does mention oil; actually, barely mentioning it but at least providing a merciless analysis of the Yemen situation. Qais Ghanem defines the future of Yemen as "bleak", and correctly so. But it is not just about Yemen's future: living in post peak countries seems to be bleak everywhere. Why such a pessimistic headline? Why not speak about hope in order to encourage people in near despair? It is because the situation is dire, and an author has a duty to describe the situation as he or she sees it. Even more so as urgent action is required, if a disaster of monumental proportions is to be avoided. Multiple disasters are looming for Yemen. One that is rapidly approaching is that of water shortage. Already, the per capita water availability in Yemen is the lowest in the world. A 2005 study by Al Asbahi estimated the total annual water requirements of Yemen to be 3.4 billion cubic metres. At the same time renewable sources, such as rain, can provide up to 2.5 billion cubic metres. There is, therefore, a deficit of 0.9 billion cubic metres, which has to come from the aquifers deep underground, which are progressively depleting, and may run dry by the time US President Barack Obama finishes his term, and starts writing his autobiography! We know this because wells have to be dug deeper and deeper, many as deep as half a kilometre. The mismanagement of water resources is shocking. Due to a lack of maintenance, loss from leaking pipes can be as much as 60 per cent. Contamination of water, by sewage seeping into the ground, is difficult to measure but significant. Wasteful flood irrigation is the norm in Yemen, whereas drip irrigation would be 50 per cent more efficient. As expected, agriculture uses 90 per cent of the available water, but half of that is squandered on growing qat, the infamous mild stimulant of Yemen and the countries of the Horn of Africa, which have a per capita GDP of under $1,000 (Dh3,673), the lowest in the world. Yemeni farmers grow qat because it sells and has profits that are at least five times higher than other crops. In July 2013, Foreign Affairs website published an article titled ‘How Yemen Chewed Itself Dry’. Yemen has the occasional floods caused by heavy rains, as happened in 2010. But it does not have the dams or expertise to save such huge quantities of water—for a non-rainy day! Unlike some countries in the Gulf region, Yemen can neither afford the cost of desalination nor of pumping water uphill from the Red Sea level to the mountains of the capital. Sana’a’s current population of two million is projected to reach four million in a decade. The consequences are predictably serious. First, food production will suffer, and food prices will skyrocket. When farmlands run out of water, the animals also die of hunger and tourists stop coming. When poverty reaches a critical level, neighbours begin to fight over water resources. In a country that has 25 million people and 50 million guns, civil war is just waiting to erupt. Even today, an estimated 4,000 people are killed every year in disputes over land—many more than the victims of terrorism or drones. It is not only water that is steadily depleting—oil is too. Foreign aid is very unpredictable, and comes with strings attached, such as a carte blanche to assassinate Yemenis with Obama’s drones. The prospects are even worse when we factor in the fertility rate in Yemen, one of the highest in the world. Last week, I attended a one-day conference on Yemen at the London School of Oriental and African Studies, where I learned that there would be a huge increase in the teen population over the next 15 years. Ordinarily, that would be an encouraging development. Not in this case, as these youngsters will be unemployed but will be well-versed in social media, and therefore well connected and presumably well informed — the requirements for riots and revolution. So, if these dire predictions above are correct, what should Yemenis do? I would respectfully suggest to my kith and kin that they first and foremost realise that the solution needs to come from them. The international community will only take feeble, temporary and strings-attached actions. Second, Yemenis must find a way to ban qat. There! I said it! There will be many who might say that I have lost my mind. It won’t be easy. It will require an intensive and extensive educational pan-Yemen campaign, like the one mounted against smoking, and it will need to be a gradual one—over five years. Yemenis should be watching numerous daily TV ads about how to help themselves, instead of wasting time watching the contrived comings and goings of the president. Fortunately, qat is not an addictive drug, because it does not cause classic withdrawal symptoms. Many Yemenis who moved to GCC countries abandoned qat and are now very prosperous. Water, thus saved, could be used for human consumption, as well as for tourism and for the growing of vegetables and fruits. Farm animals should then thrive. If Yemenis are not willing to do that, then let them stop complaining about thirst, diarrheal and liver diseases and ulcers, poverty, the absence of a modern state, and corruption. Let them also stop seeking handouts. It is ironic that the Kingdom of Sheba established its prosperity with the construction of the Mareb dam — 3,000 years ago.